Fort Lauderdale, FL – The national average price of gas went up by a penny during the past week, the first time in several weeks the price of gas has notched in any direction other than down. The price change is detailed in the weekly petroleum update from the U.S. Energy Information Administration. The EIA report shows the price of fuels went down for nearly all regions, but a sudden jump in prices across the midwest pushed the national average higher. 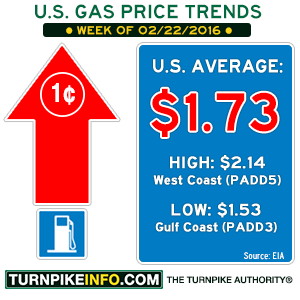 The U.S. average gas price now rests at $1.73 per gallon of regular unleaded. The same trend affected diesel prices, but not as intensely, according to the weekly report. The national average price of diesel held steady, overall, at $1.98 per gallon. But prices went up across the midwest and along the gulf coast.